With dramatic volcanic landscapes, arty attractions and a sunny climate, the most stylish island in the Canaries makes a smart choice for a villa holiday. Why go? Easy to reach with good beaches and a non-stop holiday mood, the Spanish-speaking Canary Islands are a deservedly popular destination – but you need to pick your spot with care. Lanzarote is the most easterly island, with a whiff of North Africa and a quieter, more cultured atmosphere. Development has been kept in check and many towns are a picturesque jumble of whitewashed houses with green woodwork and terracotta-tiled rooves. Add in a rich black soil, bright green cacti, abundant flowers and the crashing blue sea, and you can’t help reaching for your camera. When? Anytime – expect hot weather in summer. You really must… Get a hire car and go exploring. The island has good roads that are often quiet, with lots of scenic viewpoints to enjoy. One top draw is Timanfaya National Park, where you can see the burnt-out world left from volcanic eruptions in the 1730s, which covered nearly a quarter of the island with lava and ash. Today it looks like a mashed-up chocolate brownie – guided tours of the park can only be made by coach and take 45 minutes. 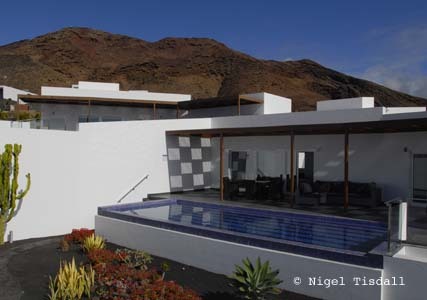 Another rewarding attraction is the engaging art and architecture of César Manrique (1919-1992), an islander who devoted his life to ensuring Lanzarote was not ruined by modern progress. He created several outstanding landmarks, including the clifftop Mirador del Río at the northern end of the island, which has spectacular views to the sister island of Graciosa, and Jameos del Agua, a plant-filled auditorium set inside gaping lava tunnels. His Jardín de Cactus, hidden inside an old quarry with over 1,400 plants, is also worth visiting, along with his subterranean home at Tahiche, now the Fundación César Manrique. Find out more about this inspiring man at fcmanrique.org and centrosturisticos.com. Stay at: A villa offers a far more relaxed break than a hotel and is a smart choice if you’re travelling with family or friends. Many of us like to cook and it’s a treat to have your own pool to lie by. The best villas now come with contemporary furnishings, a top class kitchen, a barbecue, high quality audio and TV systems, plus a welcome hamper with beers, wine and cheese so you can get the party started straightaway. 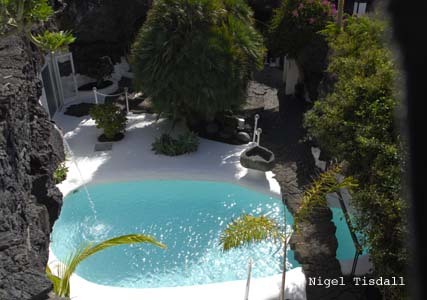 We checked into Natural Retreats (naturalretreats.co.uk), an enclave of ten designer self-catering properties sleeping up to eight guests that lies on the outskirts of Playa Blanca, a popular resort at the southern end of the island. The pools are terrific and the two-level villas are set in attractive gardens with cacti and palms. While we had problems with the Wifi and TV reception, plus some unwelcome smells and insects, assurances have been given that these issues are now resolved. Some villas get most of their sunshine in the morning or afternoon so state your preference, and you’ll need to get in the car to visit a decent supermarket and Marina Rubicón (marinarubicon.com), a pleasant waterfront promenade of shops, restaurants and yachts. A week in a three-bedroom villa costs from £692, including Wifi, welcome hamper and the advice and support of a concierge team. Dine at: Self-catering means making the inevitable supermarket sweep, and the best option for this in Playa Blanca is the hard-to-find but well-stocked HiperDino in the town centre, which has an underground car park. Try some Lanzarote wines, which are created from vines planted in the volcanic soil – the Stratus label is good, and you can go for tastings in the wineries at nearby La Geria. The island is a great place for picnics, both on the beach or inland, and it’s worth visiting some restaurants serving Canarian cuisine. You can get good grilled fish for around £12, which is usually served with a salad and papas arrugadas – small, locally-grown potatoes cooked in salt water in their skins and served with a red or green mojo sauce. In El Golfo, Bogavante (Avenida Maritima 39, 00 34 928 173 505) is an unpretentious restaurant where you can enjoy a typical fish lunch mixed with exhilarating sea views. To the east of Playa Blanca, Kiosko Las Arenas (00 34 928 173 667) is a friendly spot for lunch overlooking the unspoilt beaches of Papagayo. Bring home: Lanzarote cultivates aloe vera, which is used for health and beauty products. You can pick some up, along with locally-made crafts, clothes, jewellery and produce, at the Marina Rubicón market in Playa Blanca on Wednesday and Saturday 9am-2pm. Further north, the Sunday market in the old capital of Teguise is a major tourist attraction. There is decent shopping at the airport (after security), including bottles of mojo sauce and delicious cheeses from here and neighbouring Fuerteventura. 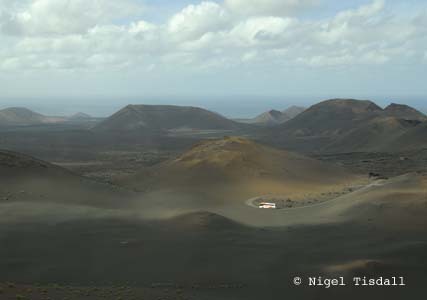 Book now: There are direct flights to Lanzarote from 17 UK airports, see flightmapping.com and skyscanner.net. A week’s car hire costs from £62 with Rhino Car Hire (rhinocarhire.com). Info: Marco Polo Lanzarote (£5.99; Mairdumont) covers the island and has a handy pull-out map, and see turismolanzarote.com.